A stunning combination of modern and classical, our fully-handmade Aphrodite collection is a stunning first impression to guests with this Save The Date option. 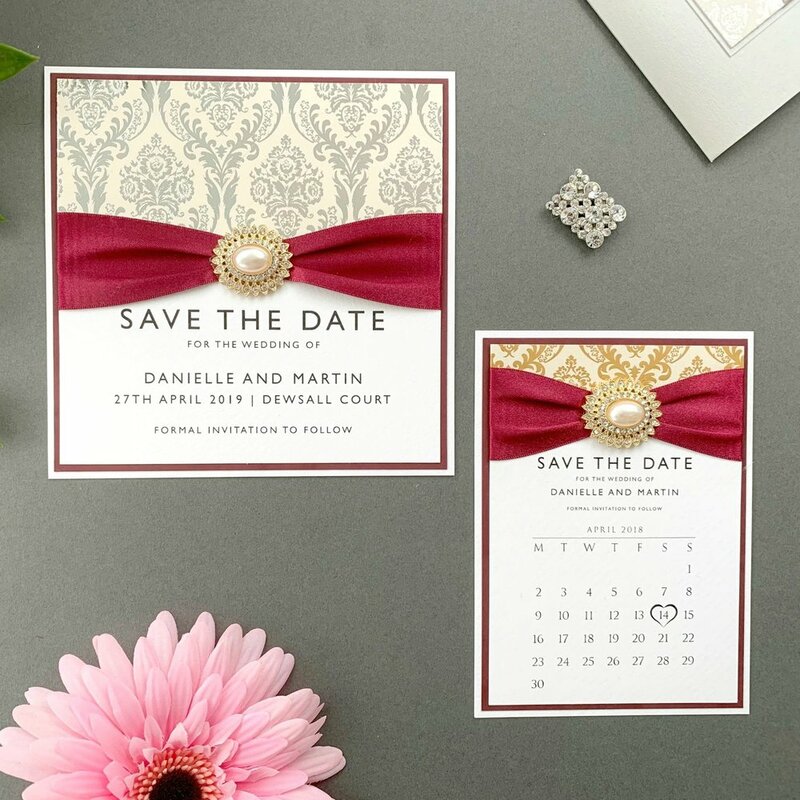 Using a Damask-style foil paper alongside Italian textured cardstock and a choice of gorgeous satin ribbons, the handmade materials combine beautifully with modern typography. We exclusively use Berisford and Satab ribbons for our fully-handmade collections, with a huge amount of colour choices on offer and a non-fray, double-sided finish. For this design we use 35mm ribbon and the pictured examples are shown using “Burgundy”. The choice of colours available can be seen by clicking below. All embellishments are shown below in their respective price bands - as standard Aphrodite comes priced with a “Band A” embellishment which can be upgraded to an alternative, such as the “Gold Tesorro” pictured from Price Band C. Upgrade pricing is shown at the foot of this page. Aphrodite is provided as standard with a white base layer. The “matting” layer is coloured as standard, which is the layer that sits between the base and the top; the pictured examples are using “Burgundy”.